We are huge miso lovers here but there are more ways to enjoy it than just miso soup! These sesame-miso roasted carrots are so pretty and delicious, they should be on your holiday dinner table! They are such a fantastic vegetable and so versatile, too! Carrots are always found on our holiday table, and this year I am showcasing these sesame-miso roasted carrots! Nom nom nom! Now that Christmas is sneaking up I really want to focus on desserts! I haven’t had time and that makes me so sad 🙁 Even if I revisit some previous recipes I will be happy 🙂 It’s my goal over the next few weeks so stay (kind of) tuned! A fun twist on a classic vegetable, these sesame-miso roasted carrots are sure to be a hit! Combine all ingredients except carrots until blended. 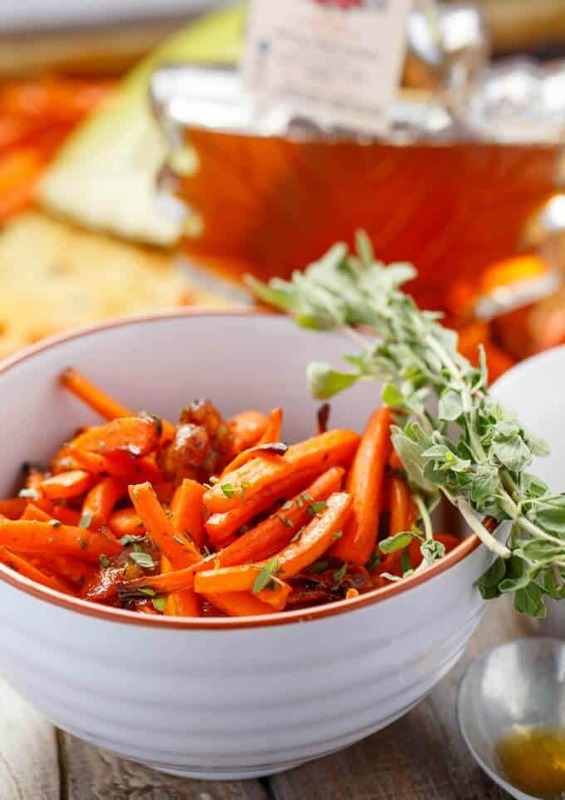 Place carrots onto a baking sheet lined with parchment paper or silicone liner. Rub carrots with paste until evenly coated. Bake for 40 minutes, or until tender-crisp, turning occasionally if browning too fast for your liking. Serve with toasted sesame seeds if desired! I love this roasted carrots! I should try one!